For those who prefer to eat their weed rather than smoke it, Baked! 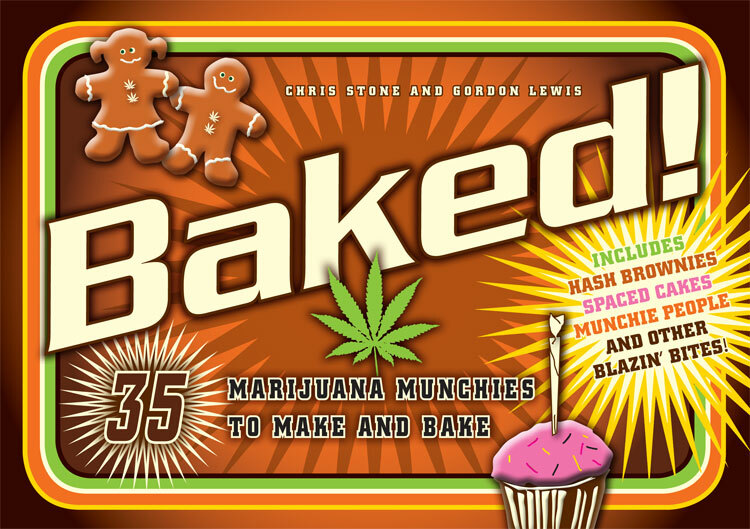 presents the perfect set of baking recipes that are easy to make and guaranteed to get you high – truly “baked”, in fact. Each recipe in this book of gustatory ganja delights is specially designed to include your secret ingredient. The recipes vary from simplified versions or variations of well-known classics such as Alice B Toklas’s Choc Chunk and Pecan Cookies, to our versions of current foodie faves like Filo Cheese and Honey Baggies and Herbal Quiche. The combined talents of Gordon Lewis (a leading cookery writer, working his magic here under a pseudonym) and Chris Stone (cannabis connoisseur par excellence) make for a peerless pair of cannabis cooks — with results that are both mind-blowing and delicious, and (if you bake half of each recipe without the magic ingredient) a healthy alternative to junk food when you next get the munchies. This is a gateway cookbook. While following the book’s recipes will get you high, its most valuable function might be teaching people who don’t cook, who have no interest in the kitchen, how to make a decent short crust, the value of roasting whole heads of garlic, and how to tell when a quiche is cooked through.